This couple’s love story would make you believe in love at first sight. Their first meeting was marked by delays as she was on a shoot. But their journey from that point to wedlock was smooth, as Mrunmayee and Swapnil fell in love. Their beautiful Peshwa-themed wedding in Pune was attended by showbiz veterans such as Nana Patekar and Mahesh Manjrekar. Swapnil is seen sharing his side of the story when the video starts and as turmeric is being applied to him during the Haldi ceremony. It was just another day when Swapnil's father informed him that he has found a perfect match for him, and that the girl was pretty and from a good family. Swapnil and Mrunmayee exchanged numbers, contacted each other and decided to meet. Mrunmayee shares her version of their first meeting in Marathi, which adds a lovely authentic feel to the whole video that showcases various functions of the traditional Maharashtrian wedding celebrations. This evocative video by P16 Studio unfolds like a movie where all emotions are captured candidly. Mrunmayee, being an actress, has a stunningly expressive face and Swapnil's happiness radiates from the screen. Their loved ones spanning all age groups - from cheerful grandmothers to enthusiastic youngsters - are all seen having a good time. Swapnil adds that he did not feel he was meeting Mrunmayee for the first time and that he felt like he had known her for a long time, and she remarks that they just clicked from the start. 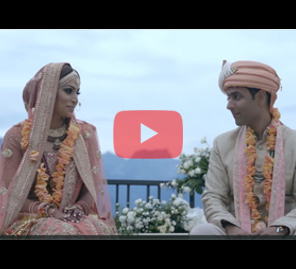 So from love at first sight to a lifetime of togetherness, this video captures all the authenticity, traditions and emotions of a festive wedding of two charismatic individuals who just look - and feel - right together.